I trusted this book because I've read the earlier work Mind and Brain by the same author and thought it was phenomenal. That book was all about providing evidence for your brain's neuroplasticity and how you can literally rewire your brain by being intentional about what you focus on. It mentioned a four-step plan on how to do this. 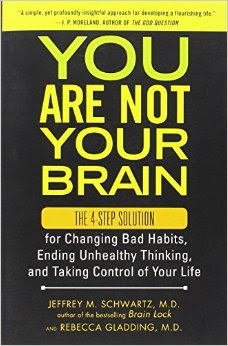 You Are Not Your Brain is a more in-depth guide to this four step method. The steps are 1) Relabel. Recognize your deceptive brain messages for what they are rather than thoughts, feelings, or impulses that you need invest in. 3) Refocus. Change the harmful action you usually associate with your negative impulses to something healthy and productive. Now, I know that this sounds simple. Maybe too simple to work. And I have to admit that the language used and even the 4-step formula was off-putting to me (which is why I only gave it 3 out of 5 stars.) But I got a very hopeful feeling from reading this book. Also, it still isn't clear to me what the distinction is between the first step, relabeling, second step, reframing and the fourth step, revaluing. It seems to me that by recognizing a thought as "deceptive," you are automatically revaluing it. So basically, this book would be even simpler as a two-step program! I got the sense that when you read self-help books, maybe it doesn't even matter which self-help book you read. What you need to do is study it and apply it. The very act of deliberately trying to improve yourself is what matters. So, I don't know at this point if this book is any more helpful than any other self-help book. It would take a few months of steady application to determine that. It also made me realize how much room for improvement I have. It included a section on thinking errors, largely derived from David D. Burns' Feeling Good, and I realized I do almost all of them. These include all or nothing thinking, envisioning the worst-case scenario, discounting the positive, emotional reasoning, mind reading, "should" statements, faulty comparisons, and false expectations. One of the things I really appreciated about this book is that it was careful to specify what NOT to do. For example, don't expect to control the initial thoughts or stop them from coming in. These harmful thoughts derive from your mind, not your brain. What you CAN control is how you respond to them. It also had a lot of useful exercises along the way (as one would expect from a self-help book.) This book did a much better job than say Happy For No Reason at developing a cogent framework for working through issues rather than bombarding the reader with possibly helpful but seemingly unrelated ideas. If you are interested in reading this book, I recommend reading Mind and Brain first, as it lays a solid foundation of scientific support for why this four-step program ought to work.